But to Sam the evening deepened into darkness as he stood at the Haven; and as he looked at the grey sea he saw only a shadow on the waters that was soon lost in the West. There still he stood far into the night, hearing only the sigh and murmur of the waves on the shores of Middle-earth, and the sound of them sank deep into his heart. 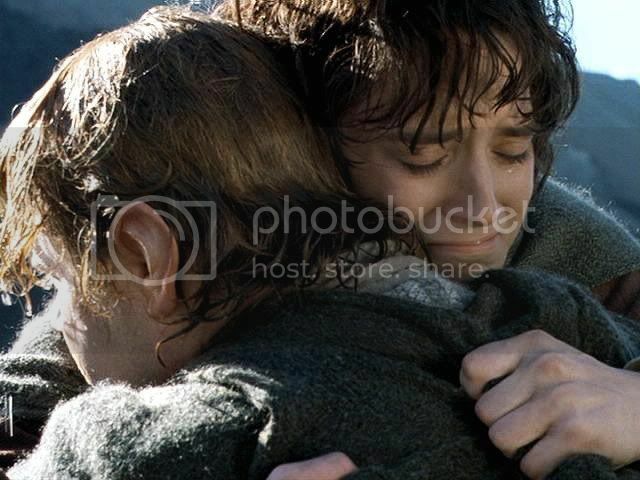 Beside him stood Merry and Pippin, and they were silent. 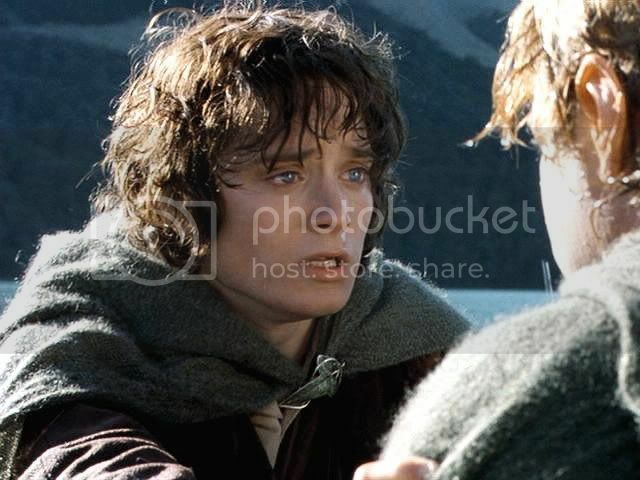 After the Ring-bearer had sailed Tolkien switches from Frodo’s POV -- with its sense of quickening hope, freshening breezes and dawning renewal -- and returns to the hobbits standing on the shore. In one short paragraph he establishes a mood that is introspective, almost bleak in its grief. It’s only three sentences long, but his choice of words conveys it sparely and well. The evening “deepened into darkness” as they stood and watched into the night. The sea was “grey”; the ship was a “shadow” on the waters, soon “lost” in the West. 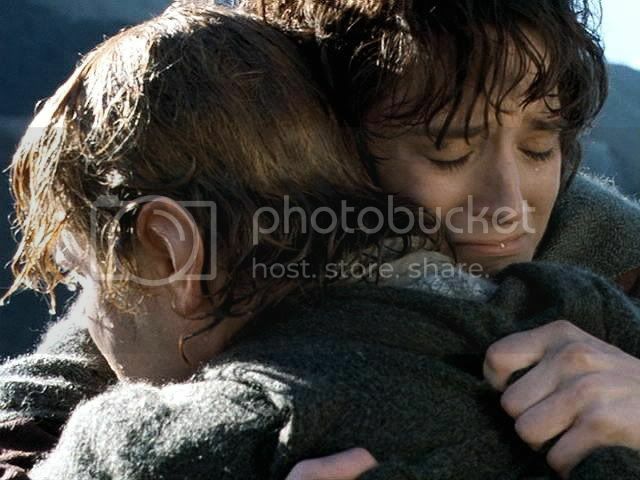 The “sigh” and “murmur” of the sea “sank deep” into Sam’s heart. There is no film scene to approximate this moment. In the film, the scene at the Grey Havens has no sense of gloom to it. It is terribly sad, but in an elevated, elegiac way. The firth is not grey; the sea does not murmur and sigh. It ripples serenely and soundlessly like molten platinum and gold. The setting is not dark and drear but the colour of pale jewels, bathed in soft ethereal light. 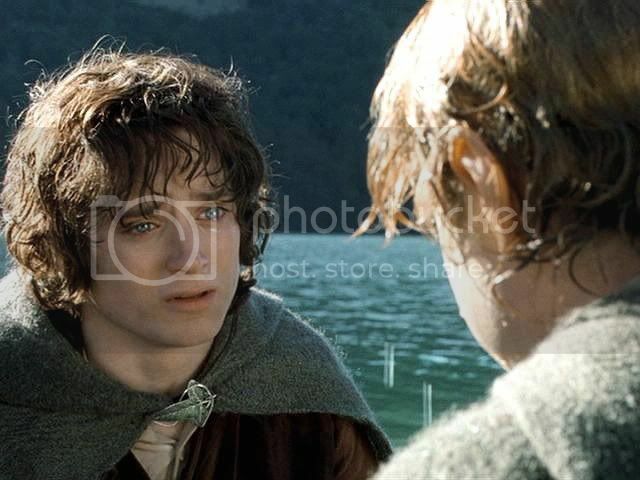 And as the hobbits watch the boat glide into the illumined distance, the boat is not a “shadow” upon the water, finally lost, but a beautiful, graceful silhouette sailing into the liquid gold until it merges with the sea of light. As much as I found this unspeakably lovely, it used to aggravate me because it was so unlike the brooding, angsty description in the book (which I cherished). Looking at the scene now, I think I understand their choices better. I think what they (the filmmakers, the art designers) were trying to do was to show Frodo’s friends (and us) not what the book-hobbits saw but what Frodo saw as he sailed: giving us a sense of his dream in the house of Goldberry and Tom Bombadil: the grey rain curtain rolled back, all turned to silver glass, and white shores under a swift sunrise. 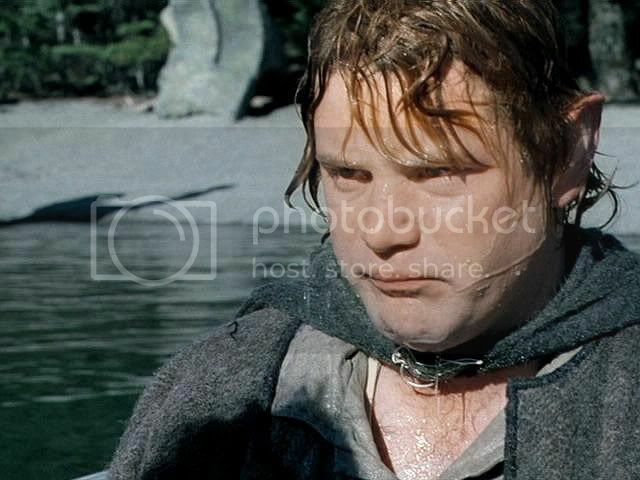 After the boat disappears in the film, the mood remains very different from the book. 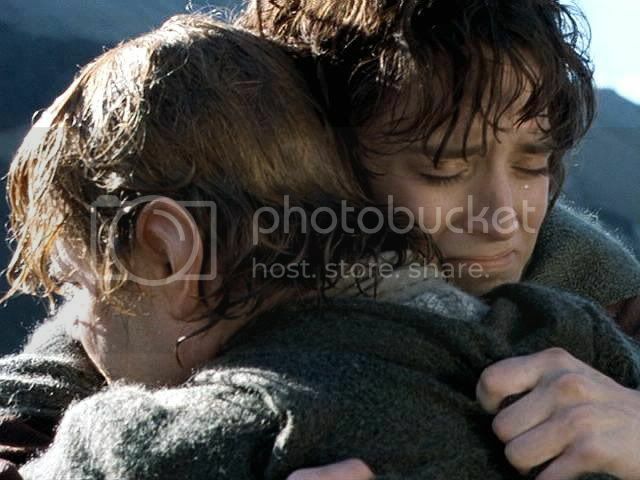 The hobbits left behind are sorrowful, but the mood is peaceful, almost beatific. 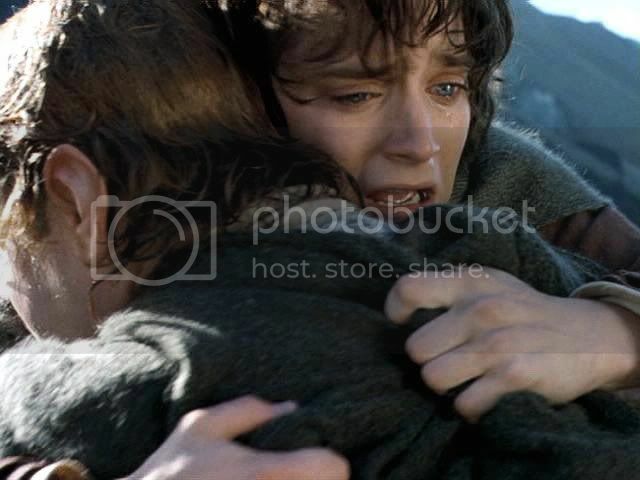 It is almost as if they had witnessed Frodo being taken up into heaven (which he has, in a way). The film hobbits don’t stay and watch into the night. 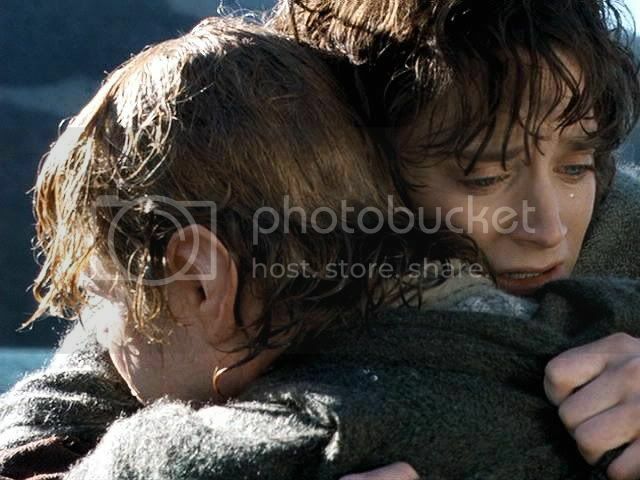 After Sam takes a last look they all turn away, ostensibly towards home and life in the Fourth Age. To convey a sense of Sam’s mood in the book’s darker scene, I have asked permission to post jan-u-wine's poem (which I adore), Not So Easily Mended. 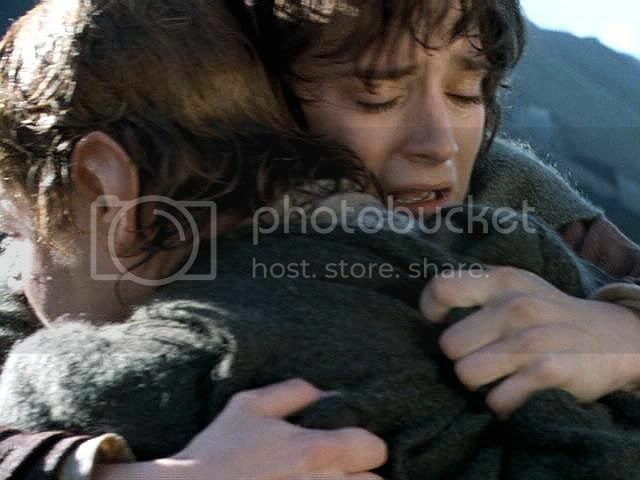 It’s written from Sam's point of view, after Frodo has left. 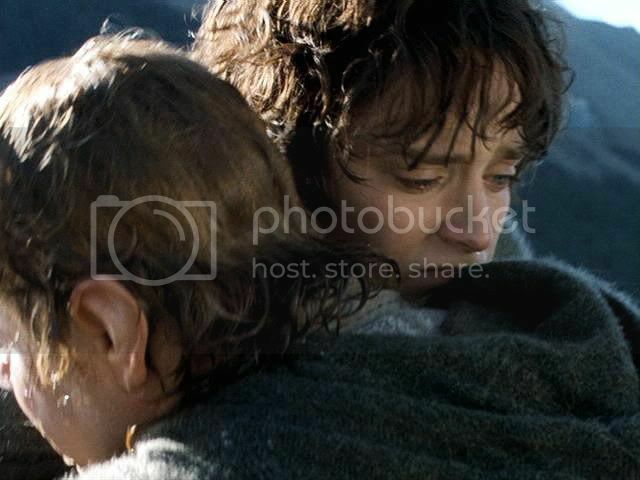 For images, I have chosen paintings by nineteenth-century artist Caspar David Friedrich and screencaps from the boat scene at the end of FotR -- the fierce hug they share after Frodo pulls Sam from the Anduin. 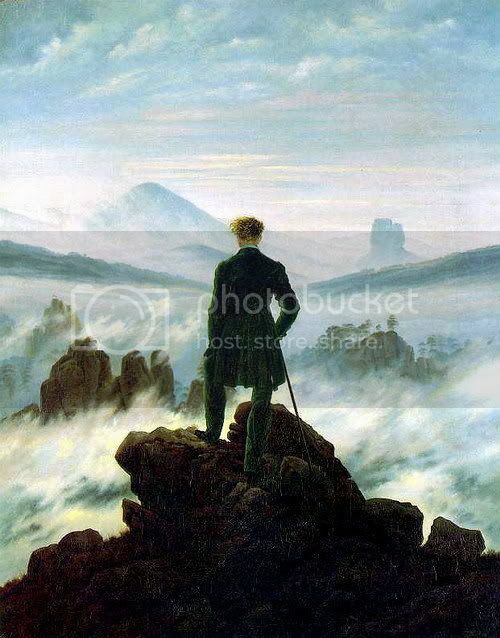 Perhaps as Sam stands on the shore he is thinking of these things, looking across the sundering Sea so vast and wide, wider than any Anduin. I see wind gentling a white sail. to missing the sound of your voice. I was not meant to be torn in two. in dreams which have no meaning. Rosie is holding my hand. have run a salty path. Her skin tastes of the Sea. that you should cry so? dying beneath the eye of the sun. in the haven of my hands. the stars of its leaves. playing out beneath wind's breath. as only a gardener could. caught in the grey web of a far-away sky. 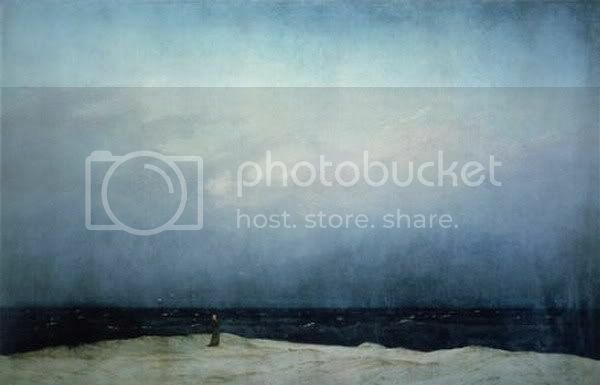 ~ “Monk by the Sea”, by Caspar David Friedrich. 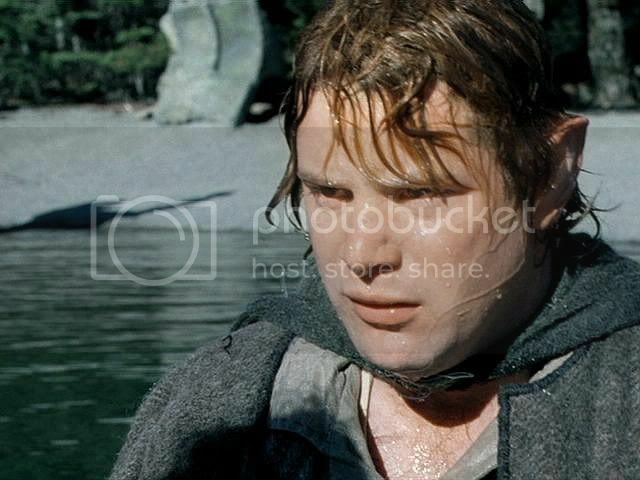 Previous screencap entry (“Frodo Sails” ~ Parting Smile caps) HERE. 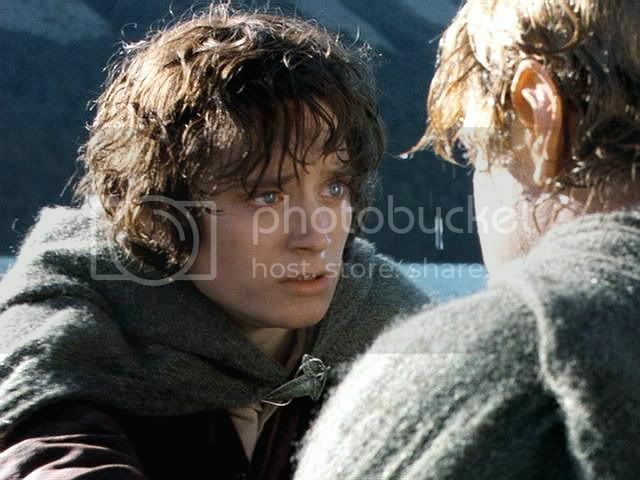 Next entry ("Frodo Waits For Sam Across the Sea" ~ 'Soon' by jan-u-wine, caps from FotR) HERE. But know, my friend, that I am reading and looking and digesting all your and jan’s gems. 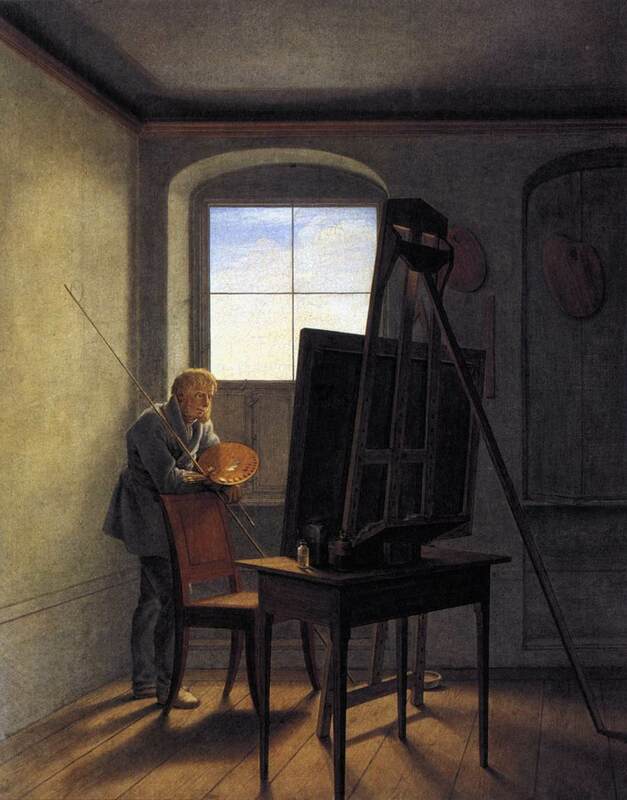 This post was especially precious to me, as it gave me a new point of view on David’s paintings - perhaps you’ve seen my LJ entry (here) on an exhibition of David’s work I visited back in June, which left me quite puzzling over the fact that I couldn't get emotionally into his paintings… taerie’s comment helped me to understand that it was probably an unconscious reaction that protected me from being overwhelmed by a springtide of sadness and desperation. I had to shield myself from it. 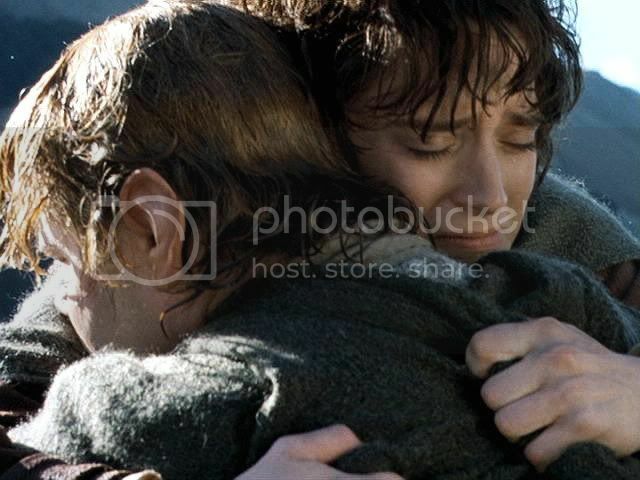 -- Thank you so much for connecting it to Sam and Frodo!